Wrigley has graciously sent me the three new flavors of the Orbit Mist line to try. Two fruity flavors – Watermelon Spring and Mango Surf – and one mint flavor – Peppermint Spray. Watermelon Spring – With the first chew, this lime green gum gives a very strong watermelon flavor – followed by a flood of sourness so strong that I was squinting my eye like Popeye the Sailor Man. I’m no fan of sour candies so I was happy when the sour flavor faded in less than a minute. Tiny crystals in the gum must be tiny sour factories, though, because every time I crunched one, a little more sourness came out. Besides that, the main flavor is a sweet, mild watermelon. It’s a nice, pleasant flavor – not overly strong. Reminiscent of kids’ watermelon-flavored gums (like Hubba Bubba) but nowhere near as overpowering. Lasting factor is good – I chewed for over an hour. Mango Surf – I was a bit hesitant to try this flavor since I don’t particularly care for mango (natural or artificial). As a dedicated Candy Addict, I pressed through my fears and popped a piece in my mouth. I was expecting a rush of sour flavor similar to what I’d experienced with Watermelon Spring. While the Mango Surf crystals did release sour bursts for the first minute or two, the pucker-factor of this orangish-yellow gum wasn’t nearly so intense. The sweet flavor that lasted for about an hour was typically mango and happily mild. I never felt assaulted by the mango-ness of it. A pretty good flavor. Peppermint Spray – Mint gums are my forte… what can be better than a quick, tasty way to freshen breath after a meal loaded with garlic, onions, and oregano? Okay, so I don’t eat onions. I do prefer spearmint, but this Peppermint Spray from Orbit Mist was quite enjoyable. It had less heat than the new Wrigley’s Spearmint while retaining a strong peppermint flavor. It’s actually inspired me to want to chew more peppermint gum. (Please don’t tell my package of Stride Spearmint.) 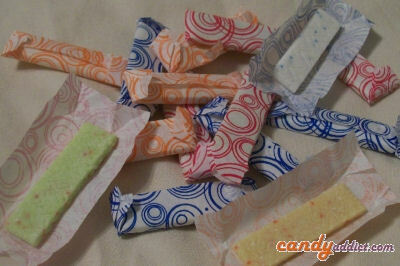 Like the other Orbit Mist gums, the flavor lasted a long time before I was ready to spit it out. I would like to suggest a choc. nugget with walnuts in it! I make them in my kitchen and they go over so well in all my circles. I am sure that you could make them more afforable than I. I’ve tried to contact you before but the Anti Spam keeps me away.